Stems: Erect or ascending, simple or branched. Leaves: Alternate, simple; blade spatulate to oblong, .3 to 2.4 inches long, .04 to .4 inch wide, apex rounded or acute. 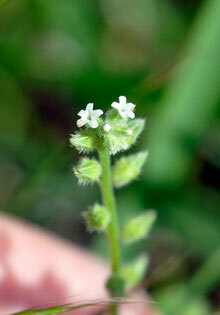 Flowers: Sepals 5, fused below, calyx ca. 1. inch, lobes lanceolate or triangular; corolla white, tubular, .1 to .12 inch, 5-lobed; lobes spreading, apex rounded; stamens 5, included; pistil 1; style 1. Fruits: Schizocarps; nutlets 4, brown, ovoid to ellipsoid, .05 to .06 inch, smooth, margins sharply keeled. Habitat: Tallgrass prairie, glades, pastures, and openings in oak-hickory woodlands. Comments: The plants are hirsute to strigose. Myosotis, mouse and ear, alluding to the leaves of some species and verna, vernal.